Since product launch, ASAP-1® hardware has become the standard piece of preparation equipment that engineers involved in disciplines such as failure analysis, yield enhancement, radiation testing, and competitive analysis have come to rely on for backside preparation. ULTRA TEC has produced leading solutions for backside preparation since 1999. With over 300 ASAP-1 units installed in Semiconductor industry labs throughout the world, we are proud to introduce the ASAP-1® IPS. Ever since the inception of the ASAP-1 Project, ULTRA TEC's goal has been to offer both user-friendly and sample-friendly tools. The ASAP-1® analog systems offer elegant, intuitive controls which have enabled all labs to achieve quality results for subsequent analysis with Photon emission microscopes, laser/ thermal stimulus microscopes and FIB's. The user-friendly intutive nature of the analog units has been carried forward, and expanded with ASAP-1® IPS. ASAP-1® IPS offers deep sub-micron control on X, Y and Z axes, making it 'hands-down' the most accurate system ever seen in the market. ASAP-1® IPS enhances the marketleading attributes of our legacy products with the latest digital technology. 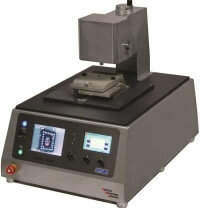 It is now possible to grind substrates thinner, polish flatter and de-process even more accurately. ASAP-1® IPS introduces a suite of features that automate many aspects of the process – from analyzing the part to be processed, to writing intuitive programmable recipes, to reading in-situ end-stop indicators that ensure each important sample is prepared correctly. The patented 'float down' polishing head design is retained, and enhanced with the use of force feedback. to achieve the quality of final polish demanded by customers for backside microscopy, Laser scan, FIB and SIL. A touchscreen interface, a physical joystick and encoders – alongside a suite of intuitive software and hardware features — empowers the FA technician & engineering professional for the next generation of failure analysis. The Wax-in plate allows for packages with long vertical leads ("dead bug") or those with 'difficult' or non-standard shapes to be held in position for Selected Area Preparation. Re-mounting station for Xybove final polishing tips. The XYBOVE Re-Application Tool makes replacing XYBOVE Tips straightforward and rapid – especially on smaller 1mm and 2mm diameter tools. Flip-over Sample Holder Allows for ULTRACOLLIMATOR alignment of packages and samples that have no access for 'opposite-side' alignment. Standard Mounting Plate for ASAP-1 systems. Mounts on to the system with four corner dowel holes and screw holes for even stronger mounting, if required. Includes flat, ground and lapped anodized aluminum surfaces, with a center optical alignment for use with the ULTRACOLLIMATOR. Tapped holes are include for mechanical mounting with wafer clamps or similar. Holders that work with the Standard Mounting Plate for ASAP-1 systems. Repeat Holders – namely the Corner Square and the Small wax-in holder – allow for many of the same part to be sequentially processed, without the need for re-centering or recalibration of the ASAP-1® system.